This year was my third time visiting the Nuart Festival. I went first in 2009 as a tourist, returned in 2012 to participate in Nuart Plus (the conference portion of the festival) participant, and finally this year participated in and helped a bit to plan Nuart Plus. I have a lot of love for Nuart. For me, the three models of muralism festivals that I look to most often are Nuart, FAME and Living Walls. But, out of the three, Nuart has always confused me the most. FAME is (or was, since it’s no longer active) perhaps the only no-holds-barred street art festival. It can be difficult to tell what’s been painted legally and what’s been painted illegally, and festival organizer Angelo Milano doesn’t hide his face. In the small town of Grottaglie, Italy, it would be easy for anyone to track down Milano and confront him about painting on their home. Still, Milano never seemed to care. He just wanted to invite amazing artists to town to paint walls and maybe make a print or two at his studio. Grottaglie now has one of the finest collections of murals, graffiti and street art in the world. Living Walls is one of the most professional DIY outfits I’ve ever encountered. They are the model of a well-run muralism conference with next to no budget, sometimes stumbling but always trying to do something great for Atlanta. Living Walls has the uncanny ability to launch or at least predict the impending launch of a muralist’s career. They produce some blockbuster murals, but usually not from the artists you would expect. 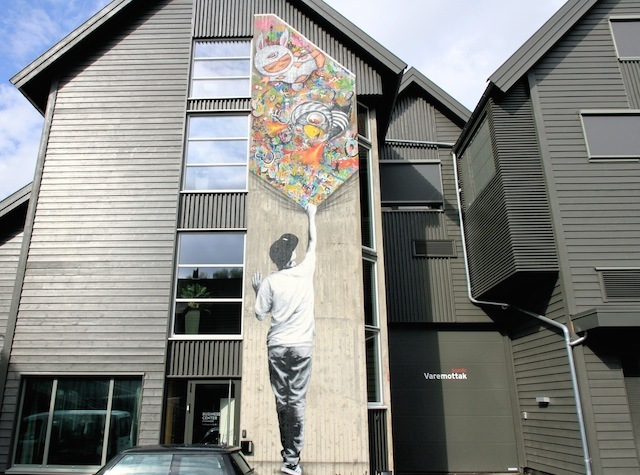 Martin Whatson (with BON and Alex Face) at Stavanger’s Scandic Hotel. Whatson’s art also decorates the inside of the hotel. Sometimes, this schizophrenia results in beautiful things that few other festivals would be able to facilitate. 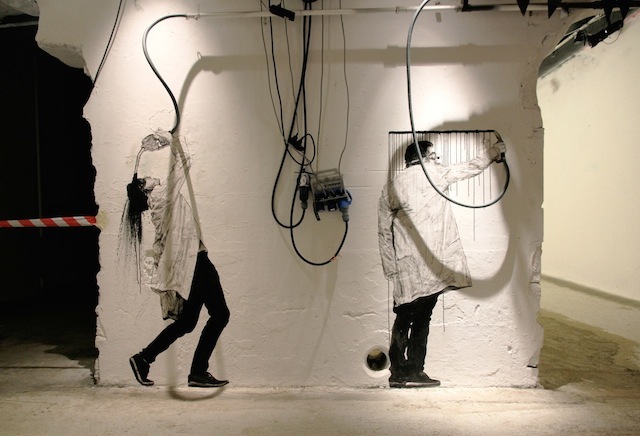 Maismenos‘ mural, indoor work and outdoor interventions this year are a great example. 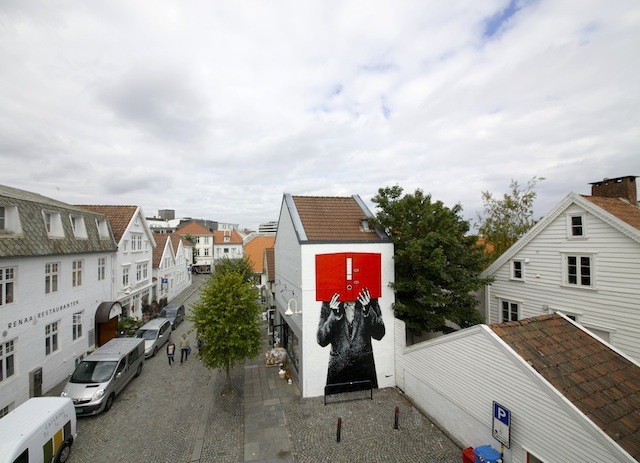 Reed isn’t afraid to let artists get political, with their topic of choice typically being oil, since Nuart takes place in the oil city of Stavanger, Norway. 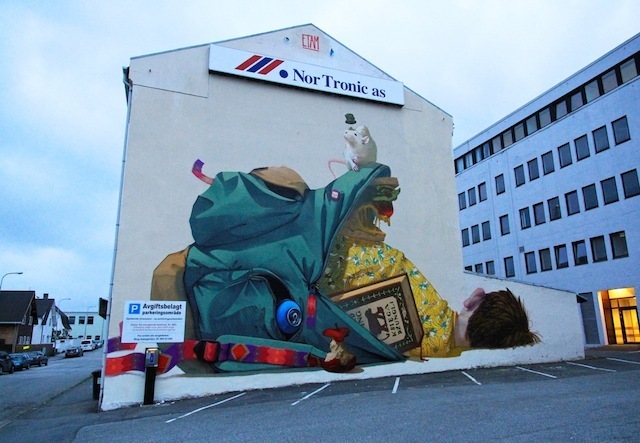 And maybe he’s only able to get away with that because he also brings in artists like Tilt and Etam Cru. What I find so funny is that even though most street art festivals are more like the “muralism” side of Nuart, even participants, volunteers and visitors to the festivals tend to enjoy the “activist” side more. At the annual pub debate, the kickoff to Nuart Plus, Evan Pricco and I debated Maismenos and Mathieu Tremblin essentially on the question of “What’s better: Activism or muralism?” Evan and I were assigned the side of muralism, and from the start of the debate through to the end, the crowd was overwhelmingly on the side of activism. 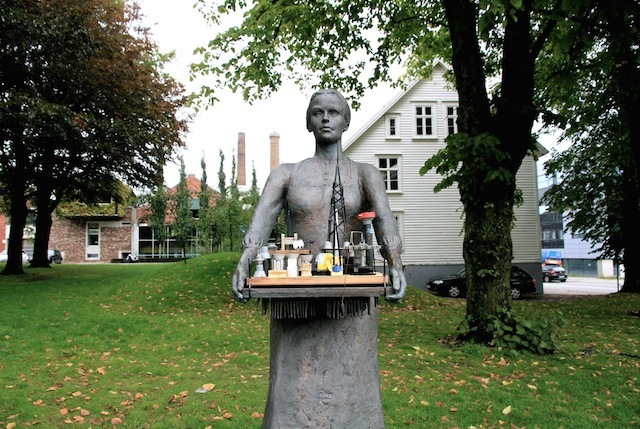 And Nuart is one of the few festivals that has been able to maintain its “activism” side as it has grown. I have to hand it to Reed. By planning a few safe blockbuster murals that the town gets excited about and the blogs get even more excited about, he gets the leeway to bring in what the people really want: The artists who are going to ask for forgiveness rather than permission. But this isn’t just a trick to take advantage of the city and of artists willing to paint big safe walls. Reed does seem to genuinely enjoy both sides of the festival, and so do I, to a point. Some of the “safe” murals are great, and many aren’t actually so safe. Even with permission, Reed gets away with a lot that might be forbidden at other festivals. Etam Cru‘s work looks as good in person as it does in photos, which I wasn’t expecting. 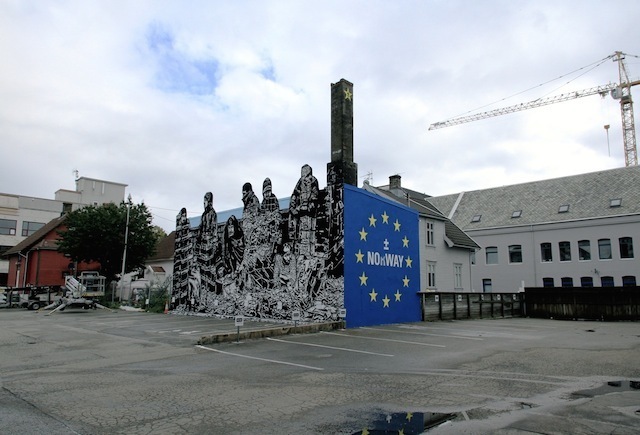 Although admittedly he wall isn’t the most visible unless you go looking for it, Maismenos got pretty confrontational with his mural about whether or not Norway should join the European Union. Andreco‘s mural is, very subtly, about oil spills. 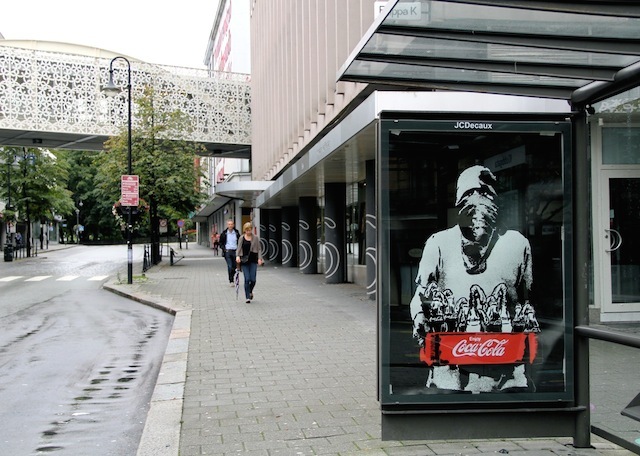 Icy and Sot‘s mural is one of the more interesting things I’ve seen done with stencils, and I’m looking forward to seeing how their work continues to develop. 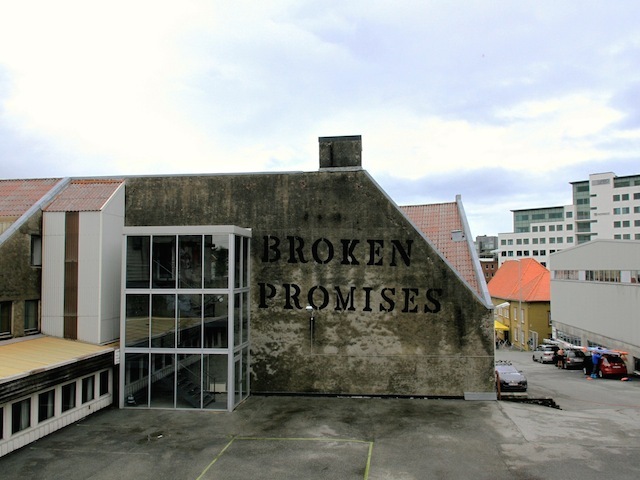 And while I’ve heard a few people say “Well that John Fekner Broken Promises piece doesn’t make sense here,” I have to disagree. Every government, every person, breaks promises. 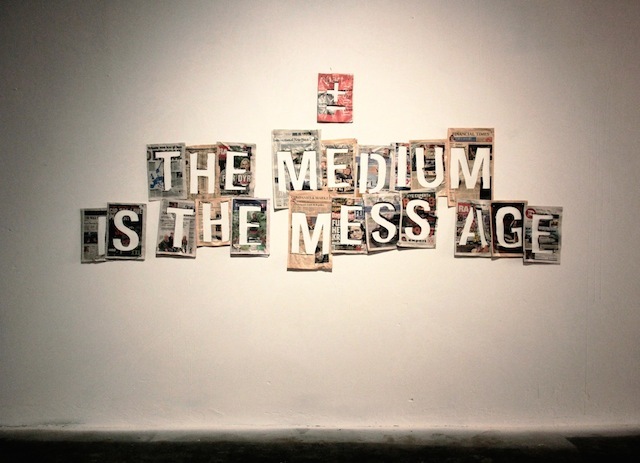 Is the meaning different than when Fekner painted the same words in the South Bronx in 1980? Of course. But that doesn’t mean that the words are meaningless. And there are a few other murals that I’m sure you saw on other blogs, some that I liked and some that I didn’t, but I won’t get into all of them here. What I do have to call out Reed for is with a couple of the safe murals that just didn’t make any sense. 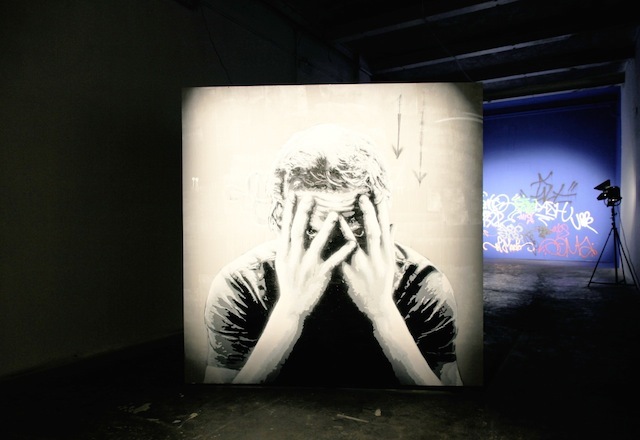 What were Martin Whatson and DOTDOTDOT doing at Nuart? 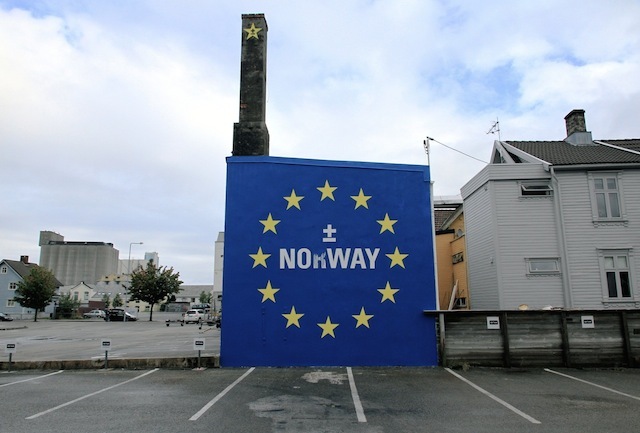 I cannot understand the appeal of these two Norwegian stencil artists, particularly their contributions to Nuart this year. 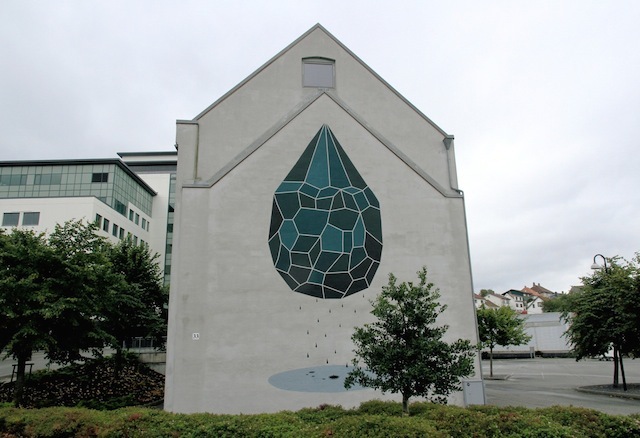 There are some solid muralists and street artists in Norway, like Strøk (who was part of Nuart this year) and Dolk (who has participated in the past), so the “we should use some local artists and promote them to an international audience” excuse doesn’t quite do it for me. Does anyone think that these two actually stack up against the rest of the great artists at Nuart? What possible reason could there be for including them? Can we all just collective acknowledge that they didn’t belong? 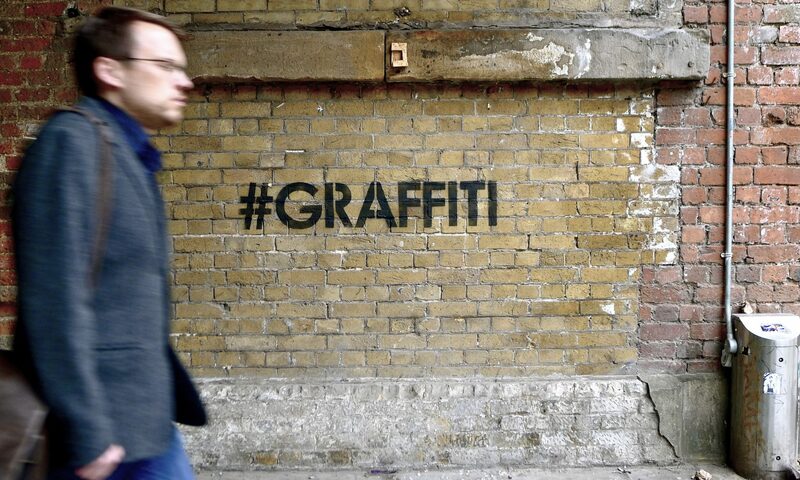 Actually not a bad stencil from Martin Whatson at the Nuart exhibition, but go around the other side of the panel (actually a box painted grey like buffed graffiti) and discover that one side is open so that you can see three walls full of a mess of tags! Pretty much the least original idea. When I saw this mural, I thought it was by Nick Walker. Turns out, it’s by DOTDOTDOT. These are not two artists who need the right opportunities and a bit of attention to become great (the sort of opportunity that Nuart, FAME and Living Walls have all been good about providing at times to young or lesser-known artists). Whatson and DOTDOTDOT just aren’t very good, and I don’t think they’re ever going to get very good. They are, frankly, unoriginal, and their work is the worst kind of decoration. Their murals are essentially the opposite of détournements. 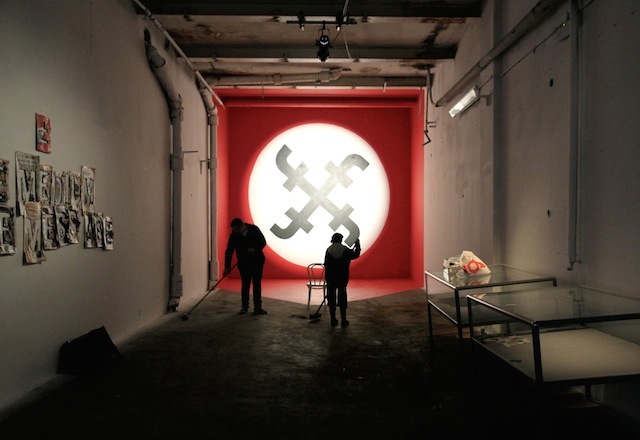 Rather than appropriating the symbols of power and modifying them to disrupt the status quo, Whatson and DOTDOTDOT reference politically and socially charged styles of art (tags and stencils) to create meaningless decor and support existing power structures. There are artists who, when I cover them on Vandalog, people give me a hard time about. And when I ask these people giving me a hard time why, they say something like, “Because I respect what you do and the artists you write about, and posting about [INSERT ARTIST THEY CONSIDER SUB-PAR HERE] devalues the rest of the site and the artists you cover, and helps the reputation of an artist who doesn’t deserve that boost.” That’s exactly how I feel about seeing DOTDOTDOT and Martin Whatson at Nuart. Their contributions devalue the rest of the festival. 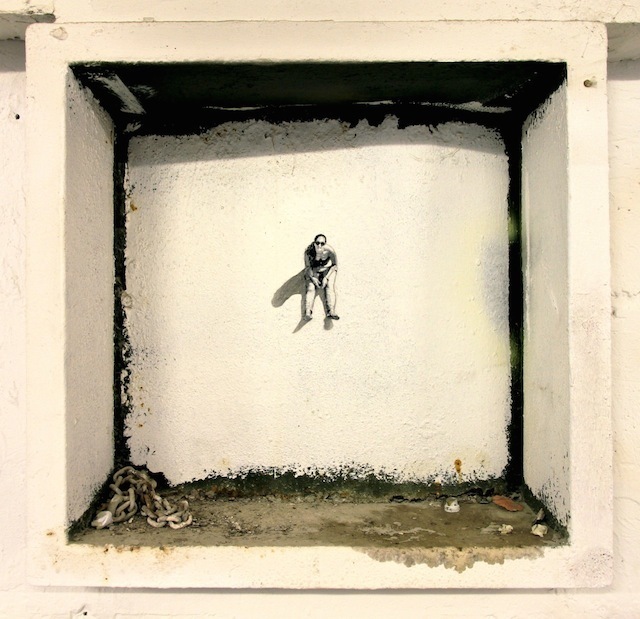 Nuart is about so much more than decorating walls. Their motto this year was “Beneath the paving stones, the beach,” the English translation of a Situationist slogan. Nuart is, even through many of their decorative murals with no explicit political content, about changing the world through art, not just putting fancy wallpaper on expensive buildings. That’s that I love about Reed’s schizophrenic beast, and also why the work of these two artists in the festival was so disappointing. 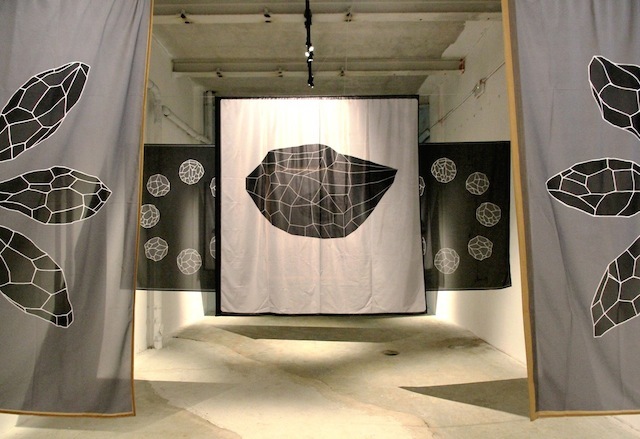 Maismenos, hanging next to a John Fekner installation. 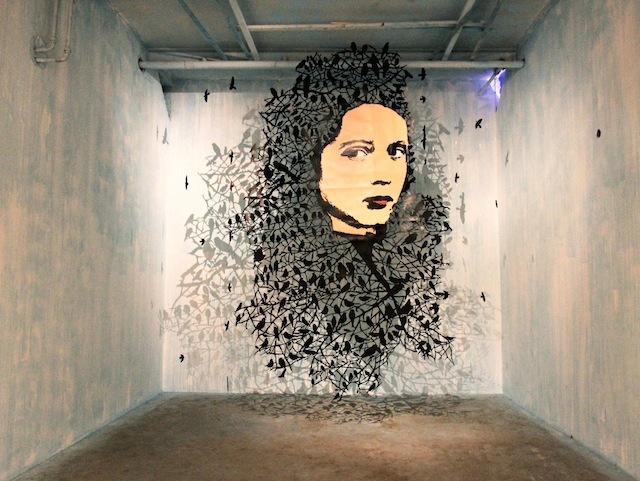 An intricate paper-cut piece by Icy and Sot, which was wonderfully lit. 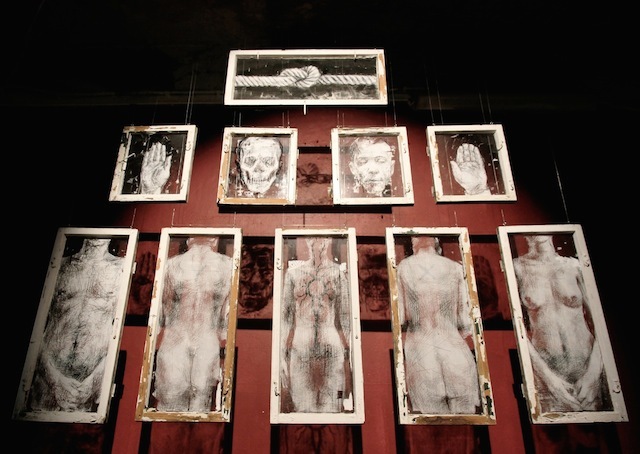 And Borondo’s installation was all about shadow too. Thanks to how each piece was painting, part of the image could only be seen by looking at the shadow on the wall. Very cool. 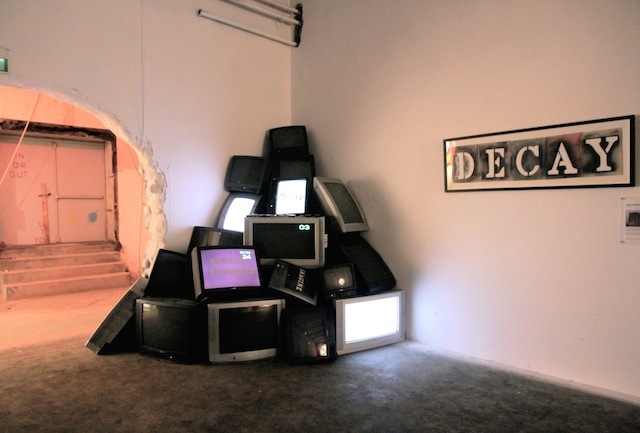 Not sure if I like this piece by Fra.Biancoshock or hate it or am indifferent to it, but it got everyone’s attention. PS: Dear Martyn, I still think you’re awesome!